Hot on the heels of their impressive Duchamp show, Blain|Southern are now showing Bill Viola. I only had a few minutes to check it out so I’m not sure if all the works on show are new, but I think they were. Whenever I walk into a gallery and see video screens my heart sinks slightly. Perhaps this is because I work with video for a living. Perhaps I dislike the invasion of the moving image into the sanctum of the still image with its concomitant insistence that I be still and attentive for the duration of the work. This seems arrogannt and presumptious. Perhaps I feel video artists are usually even more self-absorbed than the other kinds. Or perhaps I feel suspicious of the anticipation raised by the darkened gallery. This darkness in a gallery is unnatural – the intrusion of projected light in a dark space promises a theatrical or cinematic experience. Usually the work is undramatic and I feel thoroughly disappointed. I imagine a lot of video works from the ’80s and ’90s are residing on virtually unplayable U-Matic tapes. We should not be in any hurry to digitise them. Indeed the word ‘video’ itself is now an anachronistic misnomer. There are honourable exceptions to my opprobrium. To name a few: Bruce Nauman, Nam June Paik … and Bill Viola. When I saw the Angels of the New Millenium at Anthony d’Offay way back (2001?) I was astounded by it. A lot of previous video installations had turned on the sculptural qualities of the cathode ray tube, but this really pulled you into the content. It used scale, sound and time in a way that was a truly powerful experience. This show is not on that level, but there is still a considered and painterly approach despite it being lcd pixels. 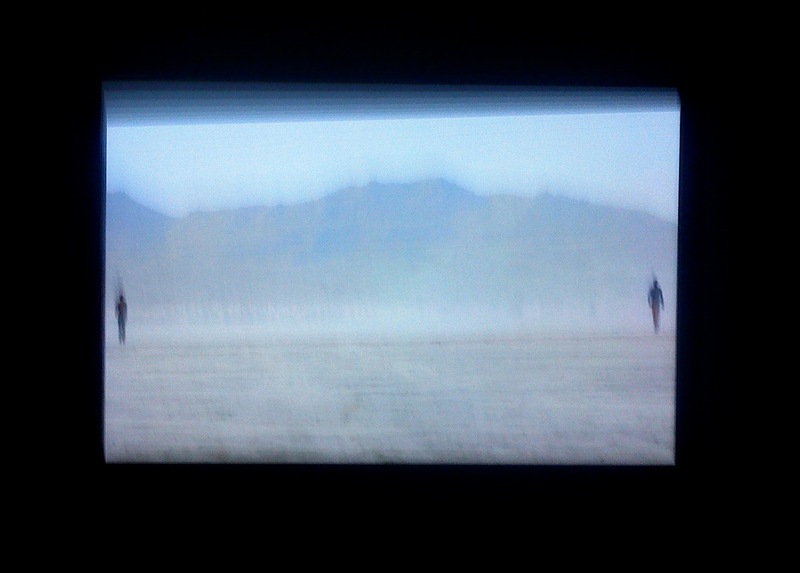 Figures walking in the desert – so far away, but distance crushed by a very long lens: hard to tell if they are approaching or receding. They are separated by an expanse of desert, but presumably they are together in that wilderness. It is compelling but quiet, timeless. Two elderly nudes examine their bodies slowly with a torch. Might be imagining this – are the giant screens they are on (presumably they are custom made as their shape is so elongated) propped against the wall at an angle? The slow pace of movement in the works and his use of composition makes his work feel shockingly like the future of painting rather than the present of the moving image. As I became more involved with them, the dark was not a false cinema darkness, but more like the inside of a Gothic church – cool on a hot sunny afternoon. I wanted to spend more time in the dark with these pieces just to look at them. Not to see what would happen next. This entry was posted in Art, Galleries, London, Painting, Sculpture, Uncategorized, Video and tagged Art, British, Duchamp, Galleries, London, Sculpture, Viola, West End.